If your required size is out of stock please select the "Made to order" option above and your dress will be made and sent to you within 4 to 6 weeks. Please enter the size you require in the comment box above if selecting made to order. 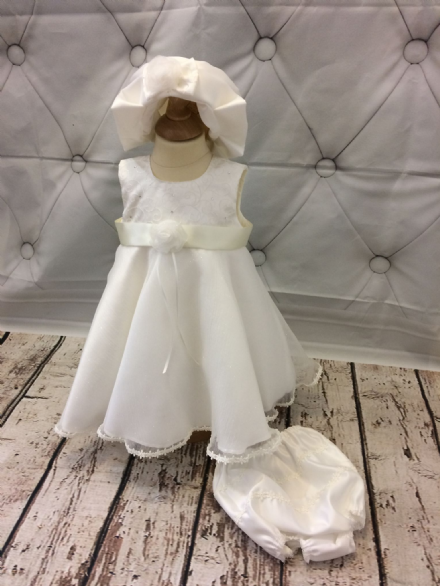 This dress is part of our bespoke christening wear collection, so sizes other than those listed above can be made. Variations to colour and design are also possible for this collection (e.g. longer length, alternative lace, alternative hat styles). Please select the "Bespoke order" option above and enter details in the comment box above. If you would like to discuss your requirements, please contact us. Bespoke orders require a minimum of 4 to 6 weeks notice and cost an additional £5. Bespoke orders are non-returnable. 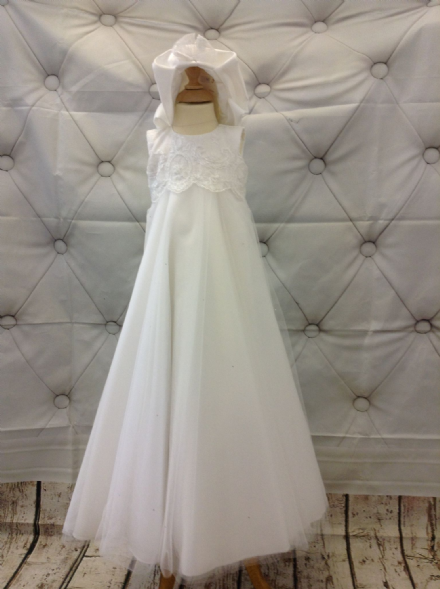 Neck to finished skirt 16" 18" 19"
Add a garmet cover for £2.50 to help protect your dress when storing in a wardrobe.